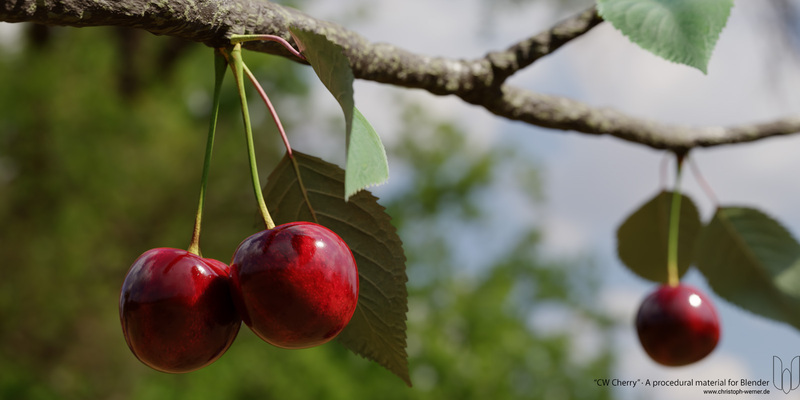 CW Cherry is a procedural material shader tree for the open source software Blender. You can create countless cherry variations just by changing some values in the shader. The cherry material is dynamic. As soon as you duplicate your cherry model, the new cherry looks different. All cherries look unique! CW Cherry material. Detail view. No textures used, all procedural! Rendered in Cycles. Two cherries in a simple studio setting (Including the cherry material). Demo Scene. Includes the branch material for free! Two high resolution renderings of my demo scene you see in the shop header. Please don’t sell or transfer this shader without my permission. You are allowed to use the shader for your own projects, commercial and free. 1. After the download of CW Cherry, unzip the ZIP-file to your preferred folder. 3. In the upcoming file browser open your local CW Cherry folder and choose the CW Cherry .blend file. 4. The .blend file opens and show a scene tree. Click on the Material folder and choose the CW Cherry material. 5. The CW Cherry material is now added into your project and you can assign it to any object via the material tab in the object properties. If you have problems to install CW Cherry, watch the installation video example on my YouTube channel or contact me please. addon, blender, cycles, Materials, render, rendering, Shader. Lesezeichen.